Nissan will be unveiling the all-new 2014 Nissan Versa Note four-door hatchback at the North American International Auto Show in Detroit on January 15th. This will be the fourth of five new models coming from Nissan over the next 15 months. The new four-door hatchback will feature new technology, and a new fuel-efficient drivetrain with improved fuel economy. Nissan says the new 2014 Versa Note will also come with class-leading cargo space. While Nissan doesn’t give us many details on the new hatchback, we know the all-new redesigned Versa hatchback is based on the Nissan Note sold overseas. Now along with the next-generation Versa sedan that was launched in 2012, the Versa hatchback makes up Nissan’s entry-level lineup in the United States. Nissan says the new 2014 Versa Note hatchback will be launched in the U.S. in the next 15 months. Next week we’ll be able to see the new hatchback that should be sportier and more upscale than the budget-minded sedan. The car was originally previewed by the Inviation Concept that made its debut at the Geneva Motor Show last year. The car was then launched in Japan and called the Note. 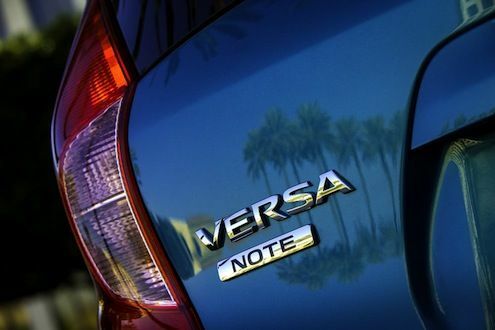 According to reports from Automotive News, the new 2014 Versa Note should have all-new styling on the outside, and a new stylish interior that will be an improvement over the sedan. The current sedan comes with a fuel-efficient 1.6-liter 4-cylinder powerplant that makes 109 horsepower and has an EPA estimated 40 mpg highway fuel mileage rating. But reports say the new 2014 model could be featured with a new 3-cylinder engine that will improve the fuel mileage considerably. In Japan, the Versa Note is powered by a supercharged, 1.2-liter, 3-cylinder direct-injected engine producing 92 horsepower and mated to a continuously variable transmission. This powertrain is rated at 59 mpg in Japan. Although Nissan has not officially announced what powertrain will appear in U.S. models, it’s likely we’ll see the three-cylinder here in the U.S.
Ford is having great success with their 1.0-liter three-cylinder EcoBoost engine in Europe, and will soon be introduced in the U.S. market. Ford is already using the 1.0-liter EcoBoost extensively in Europe in the Ford Focus and is already proving to be a success. About 30 percent of new Focus buyers in recent months have opted for the 1.0-liter EcoBoost. The turbocharged direction injection gas engine is also coming soon in the B-MAX, new 2014 Fiesta and C-MAX. Look for Nissan and other automakers to introduce the new fuel-stingy three-cylinder engines in more compact vehicles in the near future. The 2014 Nissan Versa Note four-door hatchback is getting a complete redesign outside, inside and under the hood.